But then that is only fair, because upon closer inspection, this government agenda looks very much like the corporate agenda. Let's just call it a happy confluence of interests, where government contracts out multicultural propaganda to those who can use it to cloak their mercenary purposes. Selling diversity for profit is a Public-Private Partnership. Social cohesion, civic trust and participation can go to hell. There is no better illustration of that than the latest TV commercial put out by VanCity, the financial arm of the social justice crusade. See below. It's laced with all the robotic jargon that issues out of the mouths of programmed Millenials and status-seeking Gen Xers desperate to cling to their positions on the PC pecking order. Words like "Homophobia" and "Islamophobia." You know the script. One might be given to wonder, would all of these words — all of these sins — even exist had our society not been hijacked by Cultural Marxists? If there had not been mass immigration from Third World countries? Would an ethnically homogeneous European Canada consist of young people chanting "homophobia," "racism" and "Islamophobia" like Red Guards with IPhones, tattoos and ear piercings? Can you imagine how people fifty years ago would have reacted to this commercial? They wouldn't recognize the language or the country that this claptrap was spoken in. Canadian English? You have got to be kidding. Alas, VanCity is not alone in its quest to be the company that it wants the world to be. In fact, it is just one of a herd of Canada's "Best Diversity Employers," half of whom are privately owned institutions. Companies like the Amex Bank of Canada, one of whose employee resource groups (ERGs) is "HOLA" for employees of Hispanic origin. Or CIBC which has a "Mosaic Mentorship Program" and a partnership with ACCES Employment which offers "speed mentoring for New Canadians." Or the TD Bank where there is a "Tropicana/United Way Youth Employment and Mentorship Initiative" to support "youth, newcomers and people of Black and Caribbean heritage." That's the same bank that requires all managers to take "diversity and inclusion" training (not uncommon these days). Or Home Depot with an ERG called "Orange Mosaic" which publishes a monthly newsletter for 350 multicultural employees. Or Telus which maintains a 'diversity and inclusiveness' report, and teams up with the Toronto and Edmonton Immigrant Employment Councils. Or Shell, or Cargill Ltd or Jazz Aviation L.P., which introduced diversity awards to recognize employee contributions in the promotion of workplace diversity. Or Xerox Canada which offers training in inter-cultural and 'inclusive' communication as well as 'bias-free' selection training. Or Pepsi, made famous by its kumbaya commercials that put a happy face on globalism, which joins diversity focused partnerships with groups like the Toronto Region Immigrant Employment Council and the Canadian Council for Diversity and Inclusion. The list is endless, as is the monotonous recantation of 'inclusion and diversity.' But I can't let you leave without giving special mention to Canada's number one bankster, RBC, whose motto is "Diversity Works for Us." You remember RBC, don't you? They're the corporation whose rock star CEO Gordon Nixon lobbied for a 60% hike in the government's annual immigration intake because in his words, "International experience is an asset to business." Yep, it takes a lot of international experience to serve coffee and donuts at Tim Horton's for the minimum wage. Now it becomes clear what RBC means in their "Diversity and Inclusion Blueprint 2020." As the current CEO Dave McKay said, "Diversity is not only the right thing to do but the smart thing to do." That's smart as in "profitable." 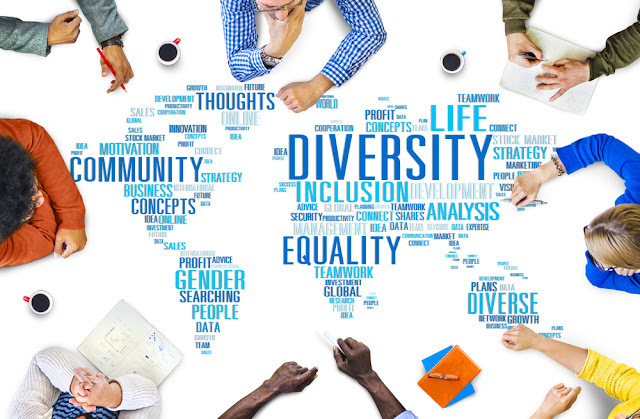 Repeating what has become the mantra and core rationale for 'affirmative' discrimination and employment 'equity,' the RBC document states that "to serve our market we must reflect it." But are commercial social engineers really reflecting the market — or are they anticipating it? Visible minorities are grossly overrepresented in commercials It is significant that of the 35 faces that can be seen on the RBC site devoted to "Diversity," 15 or 43% are non-White even though visible minorities presently account for less than half that number. That seems to be very much the rule in the span of TV commercials as well, from offering mortgages to selling furniture. The number of visible minorities which corporations like RBC or VanCity put in the shop window are substantially larger than their numbers in society as a whole. In this respect, then, these ads and brochures are more prescriptive than descriptive, or as Dan Murray said of multiculturalism, they are a prescription of what Canada should become rather than what it contemporaneously is — whether Canadians want to go there or not. Employers feature disproportionately MORE minorities in their commercials and brochures because they are trying to get ahead of the curve, trying to appeal to a growing market share in urban Canada, where nine major cities have already succumbed to a majority non-White population. In so doing, they help the government in its quest to prepare the public for what is to coming down the pike. The message is "This is where we are heading, and there is nothing you can do about it, so accept it." Or, "If have the population are not yet non-White they soon will be. The die is cast. So grow up." Just remember. War is Peace. Slavery is Freedom. And Diversity is Strength.